Update (Oct 15, 2011): Google has discontinued Shared Spaces and integrated its technology into Google+ Hangouts. The processWave.org Editor for Shared Spaces is no longer available, but you should check out its integration into Google+ Hangouts! Google has created a new home for Wave gadgets: Google Shared Spaces. Google says it is an “easy way for you to share mini-collaborative applications, like scheduling tools or games, with your friends or colleagues”. Of course, you can also include our very own processWave.org Editor in a Shared Space. To get started with a new Space, just click here and send the link to your friends inviting them to a collaborative modeling session! To participate, they just need a Google, Twitter or Yahoo account. PS: Are you planning on developing your own gadget for Shared Spaces? Check out our syncro library for concurrent editing. By the way, if you want to learn more about our development experience with Google Wave, you should check out our bachelor theses. They are available for download and also cover some interesting technical details of the processWave.org editor. It was fun working together with you all and thanks a lot for your valuable feedback! If you have any further questions about the processWave.org team or our editor do not hesitate to drop us an email. PS: If you need to get your models off the Wave before Google shuts off the Wave servers, check out our new export feature. 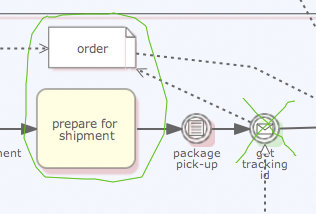 The most requested features for the processWave.org editor are the export and import of models. We listened to our users and are pleased to announce the integration of those most requested features. From today on you can export your models from the processWave.org Editor to the web-based ORYX editor, where the models can be further processed and saved in various formats (including PDF). In addition to that, you can also import your models from the ORYX editor repository to share them with your fiends in the Wave. Read on to learn, how you can use those two brand-new features of the processWave.org editor. 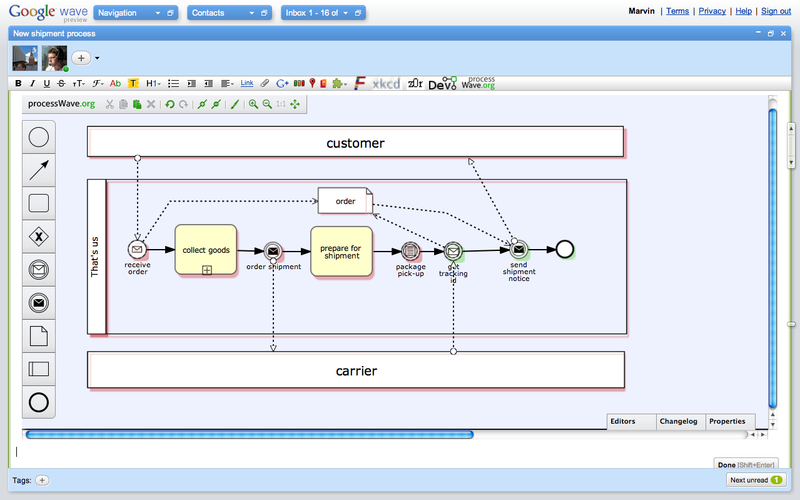 Add our gadget to a wave, choose one of our six modeling languages and create a model of your choice. 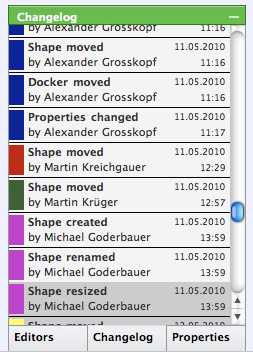 Click on the new "Export to the Oryx editor" button in the toolbar. A new tab opens that should show the created model inside the Oryx editor. 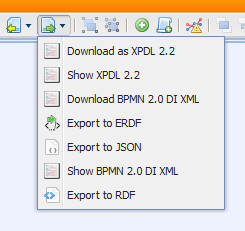 At this time, you are able to export the model in various data formats: XPDL, RDF, ERDF, BPMN 2.0 DI XML or JSON. The options that are available are shown in the export menu in the Oryx toolbar on the right. Once you are logged in, return to the tab with your model from 3. 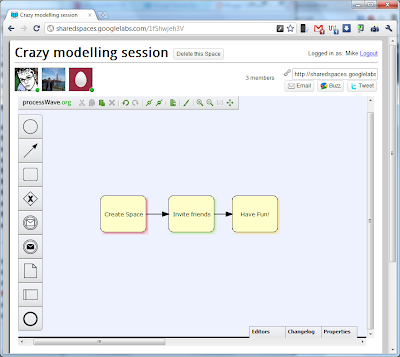 Now, you can click the save button, enter a name for the model, and save it to your personal process repository. When you return to http://oryx-project.org/backend/poem/repository and refresh the site, it should now show your new model. Of course, your model is by default not shared with anyone else and can only be accessed from your OpenID account. If you now select your model by clicking on it, you can find various export options at the bottom left corner of the site. 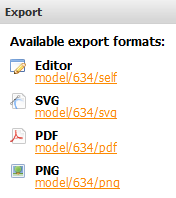 Click on one of the links, like SVG, PDF, PNG to export your diagram in these graphics formats. Go to http://oryx-project.org/backend/poem/repository and login with your OpenID. Now, you can see all models that you have access to. Click on the model you want to import to the processWave.org editor. Make sure that the model is public by checking the access rights in the top right corner. 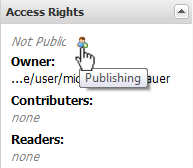 At the moment, it is only possible to import public models to the Wave, so if your model is not public yet, click on the publishing icon. When you are sure the model is public, double-click on the model to open it in the Oryx editor. 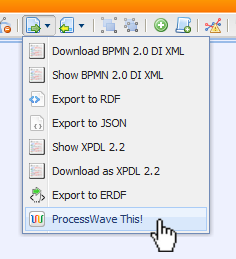 Look for the export menu in the Oryx toolbar and choose "ProcessWave This!". A new window opens that asks for permission to create a new wave. Click "continue". The new wave with the title "Oryx Model Export" is shown and contains a processWave.org editor gadget with your model. You can now rename the wave, invite friends to model collaboratively or even export the model back to your Oryx repository via the export button. We hope the tutorials above cover every aspect and you enjoy getting your models exported or imported. If you have any further questions about the new features, please leave a comment or send us an e-mail. Our talk at this year's Google I/O is available on YouTube. Check it out! The presentation of our processWave.org Editor starts at minute 25. We are back from Google I/O 2010. It was an awesome experience for us! We got a lot of valuable feedback and had many interesting conversations. Thanks to all of you who joined us in the sandbox or during our talk. PS: For those of you, who could not attend the I/O: Starting next week you will be able to watch our talk on YouTube.